The young Gyrfalcon at Sawara 2 years ago today. It was quite a fixture in the winter of 2013/14. 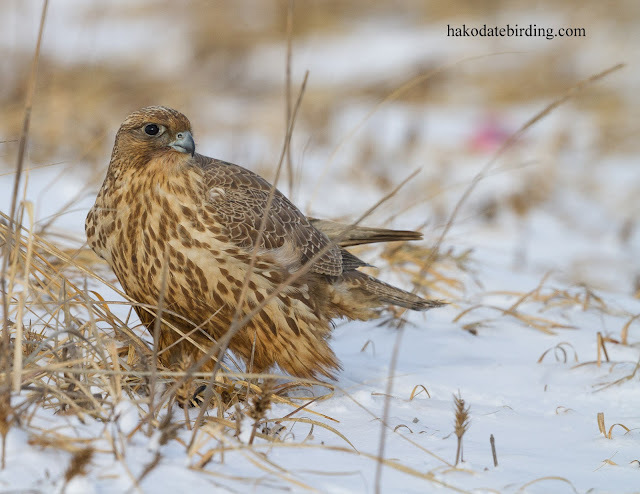 Actually there was a flurry of exceitement in December when a non birder photographed an adult white morph Gyrfalcon fighting with a Goshawk over disputed prey in a snow covered field. This was quite a way to the north and east of where we are but the hope was it was our bird on its way south and returning to Sawara as an adult in all its snowy white glory. Of course nothing came, as we all knew would be the case..............but what is life without some kind of hope, even if we know it's futile? That's why we watch England in the World Cup after all. I guess birds have their own minds, and make their own decisions without considering what humans want of them!!!!! You do have some lovely memories and photos to show for the falcon's visit though! That's true................still there were a lot of disappointed local birders last winter. Still maybe next winter eh? Ah, a touch of cynicism there...or is it despair? Realsim I like to call it. Actually I'm reasonably hopeful I'll see more Gyrfalcons in the future, England winning the World Cup though............nah.